Trying to hold small and medium-sized workpieces securely for edge-moulding, sanding etc. 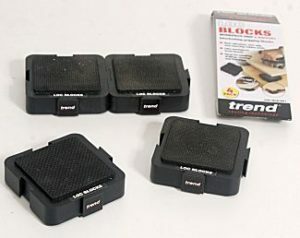 is often the most tedious part of the job, but a new set of non-slip work support blocks from Trend makes things easier. Loc Blocks are non-slip blocks that come in a set of four, and allow workpieces to be held steady without clamps. 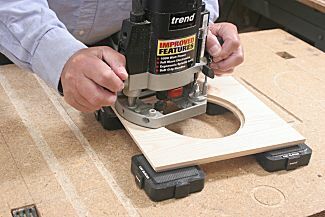 They also raise the workpiece and allow complete access to all edges. 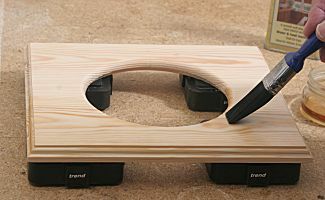 The non-slip blocks are 67mm square with an overall thickness of 25mm. They can be positioned separately under the workpiece, or all four interlocked to form a square of 173mm per side, for supporting smaller items. In use, the blocks are positioned on a clean, non-polished surface and arranged according to the shape and size of the workpiece, which is then simply laid on top of them. 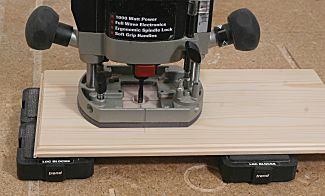 When used for routing, the blocks should be positioned as close to the edges of the workpiece as possible to prevent tipping, and the cut made in several light passes. The above pictures show various applications of the blocks, with the benefits of lifting the workpiece clear of the bench, and allowing access to all edges, being clearly seen. 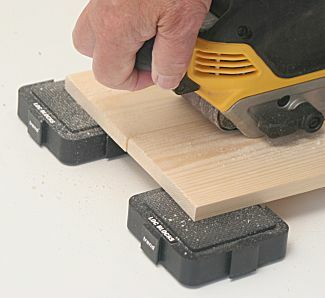 These non-slip blocks will find any number of uses in the average workshop.